Started this build with a reasonable budget (4ex + about 600 chaos). Watcher's Eye + Unnatural Instinct is 23ex. Then you still need 2 Tamings, about 3.5ex each. Damn. That being said: very good guide, thanks for that! Watcher's Eye + Unnatural Instinct is 23ex. Then you still need 2 Tamings, about 3.5ex each. Damn. hard to talk about price from items because they will always change during league. especialy things like watchers eye can ez drop and rise in 50ex range. and i bought my unnatural instinct in early league for 4ex. Thanks for the build guide. I've got my gear at a pretty decent place and having fun with consecrated path. One thing though - I still seem to be vulnerable to occasional spike damage. I'll be cruising along just fine and then go from full health (just over 5700 life) to zero without any chance to react. Any suggestions on how to help mitigate spike damage? How much of a dps loss is it to not have the unnatural instinct jewel? Nevermind I just saw your response on a previous page. Is assassin's ascendancy + vaal pact enough to ignore ele reflectt? nope, you would ez kill yourself on full reflect maps because of the high dmg output this build have. 1. Where does the freeze immunity come from? is it somewhere in the skill tree? - My uncapped resists are 85/85/85 but they change to 85/135/85 when I pop the taste of hate. - I currently just pop all 5 just before shield charging into packs. - My question is, should I stop popping taste of hate along with wise oak? Am I right in thinking the additional 20% penetration for cold (along with fire/light) would provide much more dps than the 30% extra cold dmg from taste of hate? - How much of a defensive boost is the taste of hate? I payed extra for the legacy 30% version (27 ex instead of 10 ex for the 20%). Is the extra 10% noticeable? the defensive boost from taste of hate is huge because we use abyssus wich let us take alot more physical dmg. 1. I am at level 91 now with a 117 skill pts (took alira for bandit reward). Looking at the final pts you allocated in your skill tree, I noticed you spent 4 pts to get your final jewel socket. I'm wondering do we even need more mana or mana regen? Cuz there is another jewel socket in the shadow section that only takes 3 pts and gives us dex. Just wondering if you intentionally took the 4 pt jewel route. 2. I have one more slot left on the darkness enthroned belt. Can you tell me which of these attack mods are better? 3. I'm also thinking about buying a headhunter. Are there any downsides to switching to a headhunter? Just trying to get all the information before I drop 40ex. I am mainly interested in mapping to try to reach level 95 or higher. 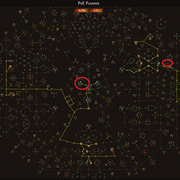 Would a headhunter significantly increase map clearspeed?